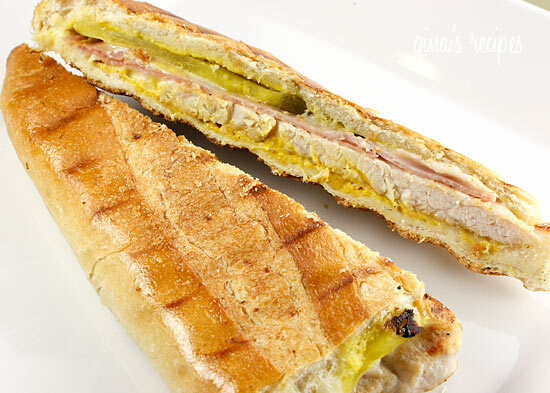 If you’re craving a Cuban sandwich, this should satisfy your craving! I have a weakness for Cuban sandwiches, if you have never tried one, they are usually made with roast pork, ham, Swiss cheese, thin sliced pickles and mustard, then pressed with a sandwich press or a panini grill until everything is hot and the cheese is melted. Very popular in Miami Florida. I think leftover turkey breast makes a great, lighter alternative to roast pork and it’s a great way to use your leftover turkey this Thanksgiving. I found this French bread in the deli section of my supermarket that was soft and perfect for a Cuban! Have one of these for lunch or dinner and enjoy!! Spread mustard on both sides. Place cheese and pickles on the bread. Add turkey and top with ham. Close your sandwich, spray the sandwich press with buttered flavored Pam and press down until the cheese is melted and the crust is a little crispy. Cut the sandwich on the diagonal and enjoy! Where do you find a fat free French loaf? That particular loaf was fat free, long time ago! Use whole wheat. The recipe I have for Cuban bread in the bread machine has no lard and no fat at all! That’s why we make it! LOL!! What kind of pickles are traditionally used? Dill or the sweet bread & butter pickles? I agree with pp that real cuban bread is amazing but no way is even close to skinny. It contains lard! I made these yesterday. They were AMAZING! Thank you Gina!!!! Cuban sammies are da bomb! This one looks excellent. BTW, while they are popular in Miami, they're a MUST in Tampa! There's a longtime debate over whose is better (Hint: Tampa!!!) We add salami to them here as a nod to the Italian immigrants who worked in the cigar factories in Ybor City alongside their Spanish and Cuban friends. Adds lots of fat & cals, so you likely won't use it in a skinny version, but there's some history for ya! Also, Cuban bread is much better than French for this sandwich if you can find it. Chewier and more flaky in the crust. Prob hard to find outside FL or a very large city, though, so I get the need for French bread as a substitute. Cuban toast with cheese and a cup of cafe con leche is a staple breakfast here, too. If you ever visit the Tampa Bay area, make sure you hit a Cuban restaurant for b-fast AND lunch! Had this last night! Very tastey! This is yummy! I have made it several times and it is a very quick and tasty sandwich. Thanks Gina! Love it! I've been loving your recipe's for a while now. I joined weight watchers a couple years ago and am now just trying to kind of use the principles to eat better currently. I just made a similar sandwich here. Do you have points plus for this one? It is one of my favorites. Thanks for sharing that bit of knowledge!! Good to know! FYI, I have a friend who use to own a bakery and in REAL AUTHENTIC french bread there is NO FAT. It was even written up in the newspaper as part of a fat free diet! A lot of supermarkets market french bread but when you read the ingredients you find some type of shortening. Again, REAL AUTHENTIC FRENCH BREAD has no fat. I found it in the deli section of my supermarket, I just read all the labels until I found one. Good luck! Hey guys, I can't seem to find FF french bread anywhere and I want to make this sooo bad…any ideas? I live in Northern California. Thanks! between lunch and dinner, and giving one to my friend, there werent even left overs for the next day, so that tells you how much we enjoyed this one! also i wanted to let you know that ive lost an addtional 12 lbs since ive started cooking your recipes and that im now in Onederland(out of the 200's)! You're welcome! You really don't miss the pork at all in this, it's amazing, isn't it! every single week i have a new favorite of your recipes! when i made these for lunch today , i couldnt believe how much these tasted like the real thing, i thought there was no way since pork and turkey taste so different. but i was so wrong! i had to talk my husband out of seconds by telling him i'd make him another for dinner! i used a package of Turkey Breast cutlets, seasoned it with Adobo and and cooked in skillet till meat was done. i know this one will become a staple in our house! thanks again Gina, you've really made it effortless for me to stick to my points and youve also made me look like the best cook in the eyes of my husband and many of my friends! much love! ok – so i'm an idiot – just reread your statement that you found the bread in your deli section! thanks! I actually just made a cuban sandwich for the firs time the other day–they are really good. I made mine in a wrap though! Hope you had a fabulous Thanksgiving! @ Susan – nope, just a skinnier recipe. I don't consider any of my recipes WW recipes. They are all just healthy, lighter delicious recipes, with points. @Duo – Yes, the pickles and mustard are a must here!!!! Pickles and mustard make a cuban! That's a WW recipe? Sounds (and looks to delicious) to be true. I love Cuban sandwiches, so I'll be linking to this for my upcoming post on Thanksgiving leftovers sandwiches. This does look really good. I make sandwiches on a VERY regular basis. My husband loves them….This looks awesome. A turkey cuban sandwich is a really good idea! oooh, great way to use those leftovers! Oooh, I love a good Cuban sammy myself! Your light version looks perfect. Thanks for sharing! I adore Cuban sandwiches and order them as much as possible when we're in Florida–the west coast makes them, too. I like the turkey filling. 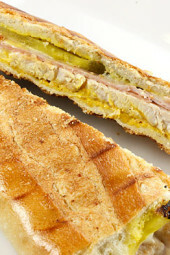 Yuummmm…..love Cuban sandwiches. Never heard of them until we moved to SW Florida. Thanks for sharing this great idea! This looks fantastic! Thanks for sharing the idea!! !